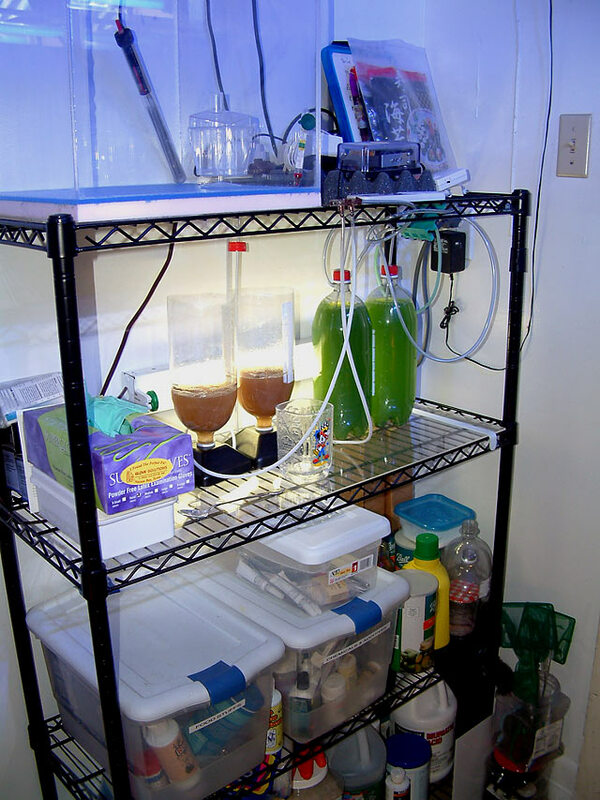 Live Phytoplankton is very expensive to buy, but growing your own is pretty easy and much cheaper. Flame*Angel from ReefCentral.com has an excellent page that I followed to get my own culture started. I store it in the fridge, shaking it once a day to avoid settling. New batches are ready on a weekly basis. 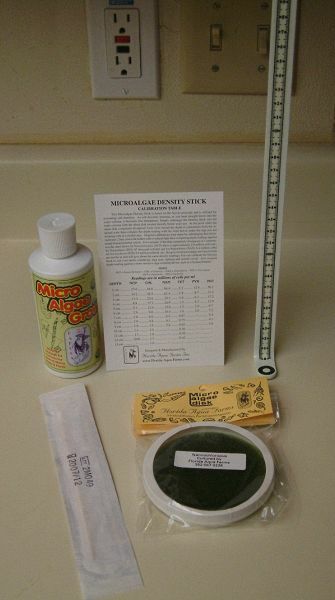 The items needed from Florida Aqua Farms Starting the culture from scratch. Here is the chart to determine how dense your culture is, once fully mature. Due to numerous inquiries, instructions are below. To start off from scratch, fill up two bottles completely, stopping about 1" from the top. It should be saltwater that is 1.019sg - using a refractometer would be ideal. 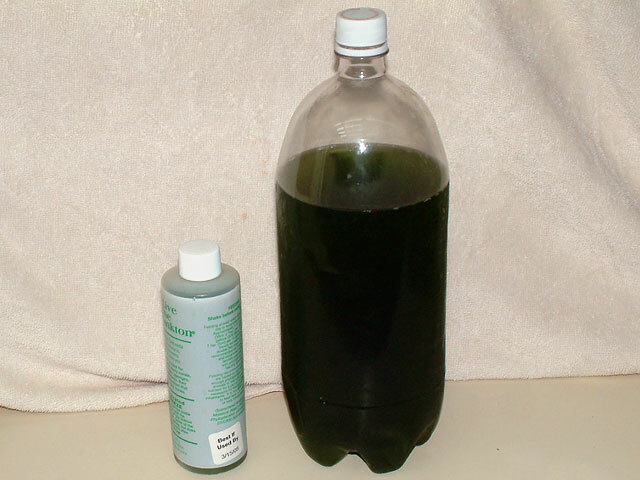 Using a full disk of Nanochloropsus from FloridaAquaFarms.com, you would scrape the green algae film into your bottle after it has soaked for 24 hours. Add 1 ml of Micro Algae Grow, also from FAF. In Image B (above) you can see what I was doing. I put 1/2 the disk in each bottle, but I think it would be better to use 2 disks -- one disk per bottle, as recommended by Susan (Flame*Angel). Set the bottles up with the rigid tubing reaching down to the base of the bottle. It should bubble gently, and not be a rolling boil. Lighting should be on for 16 hours a day, then in full darkness for 8 hours. I have mine culturing in a closet where it isn't annoying. 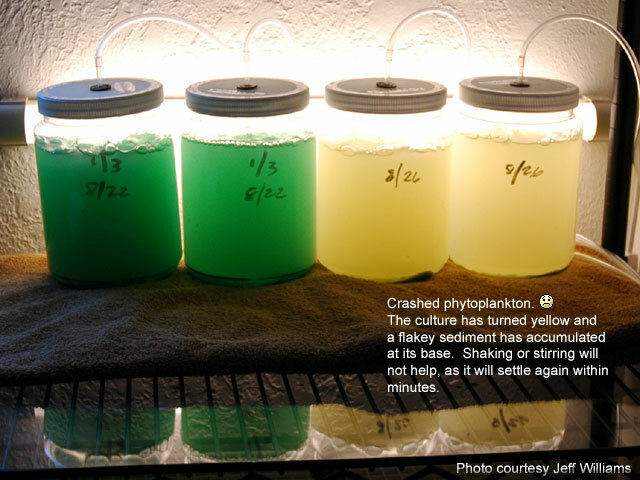 The first picture in this section shows how the culture bottles are set up in a bucket. I only make two bottles each week now, not three. In 7 days, it is time to split this culture. 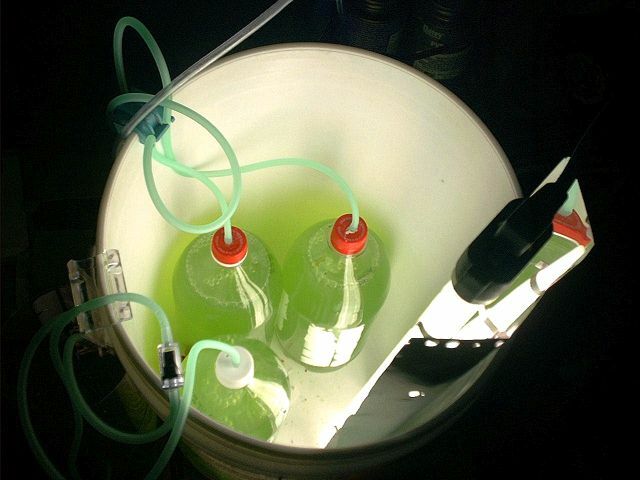 Two new bottles should be filled half way with 1.019 sg saltwater plus 1 ml Micro Algae Grow. Cap and seal tightly the current batch of phytoplankton and shake it very well, to get all sediment in suspension again. 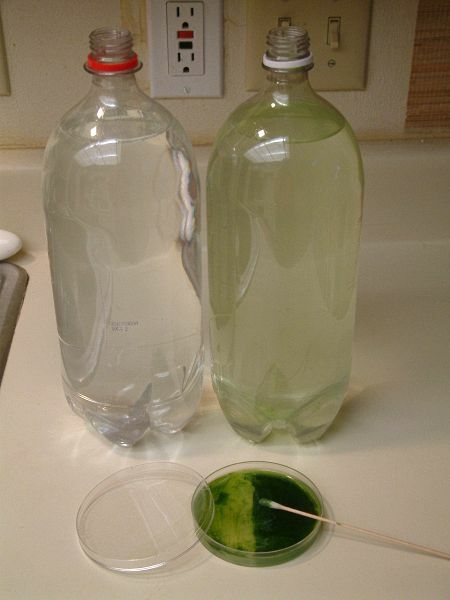 (If you wish, pour one full bottle of phytoplankton through the rotifer screen (or a couple of coffee filters if you don't have that) into a clean container to strain out larger chunks out of the phyto). Pour that phyto into each bottle filling them both up to within ~1" from the top. Those bottles are now ready to go into your station, starting the process all over again. Refrigerated phytoplankton should last at least one month. I use up almost one bottle a week, so about once a month I have one bottle too much, which I give away (and accept a small donation from the grateful reefer occasionally). You need to shake the stored bottle daily to avoid the cells settling to the bottom of the bottle. Otherwise they will smother each other and die. It is important to keep everything clean to avoid contamination, including the rigid tubing that pumps air into the 2-liter bottles. That is why I keep using new bottles (rinsed out coke bottles) rather than reusing the same bottle it was just cultured in. You can clean the rigid tubing with vinegar water (or rubbing alcohol), or simply replace it with new tubing once a month. If you reuse your tubing, check the end to make sure it hasn't become clogged. 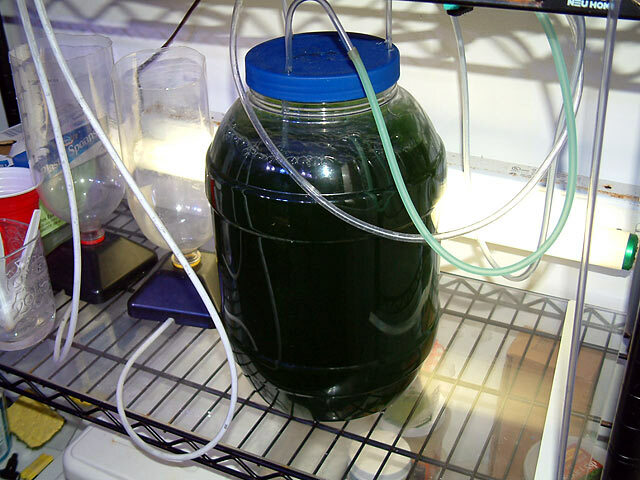 I've been growing phytoplankton for about two years. The first 6 months were a breeze, splitting the cultures to grow more about once a week, following the information listed above. Then at MACNA XV, I met Darrin of DT's Live Phytoplankton, who pretty much made me doubt my cultures were viable and possibly even contaminated. So I decided to start anew with fresh algae disks, to get the best possible product. From that day forward, I had problems. Some batches would last about 6 weeks of culturing, others barely a month. It was very frustrating. I ordered new disks from Florida Aqua Farms, new Micro Algae Grow, and tried my best to have the cleanest equipment possible. I was very attentive to the batches, but something would go wrong on a regular basis. I never should have listened to Darrin! So I turned to Anthony Calfo asking for help. (Umm. He never replied, never noticing my thread.) Lots of people chimed in with their suggestions. In disgust, I didn't bother making any more for about 2 months perhaps. Then my clownfish started to lay a clutch of eggs every two weeks, and the only way I'll ever rear them is if I have live rotifers to feed them. And to have those, you have to have plenty of phytoplankton on hand. Evan (Quiksilver) has been growing it successfully for months on end, so we talked about his procedure. His routine is very simple, and he doesn't split it for a month or longer. It just doesn't crash! Four weeks ago, I took a half bottle (1 liter) of his phyto as a starter culture. (You can also follow the guidelines above to start from scratch.) I added tap water mixed with salt to 1.019 specific gravity, until it was filled about 2" from the top of the bottle. I filled a second 2-liter bottle the same way. 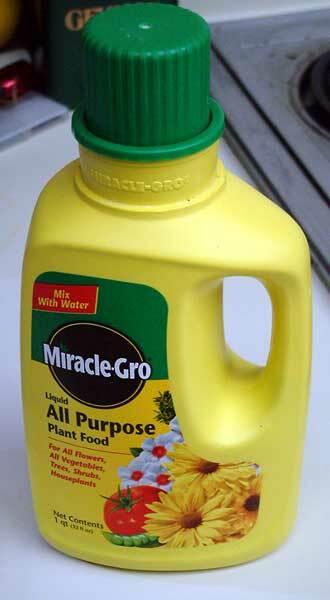 5 ml of Miracle Grow All Purpose Plant Food (fertilizer) was added to the bottle. This comes in a bottle in liquid form. If you do several bottles, use 5 ml per bottle. While it is culturing for the next few weeks, there is no reason to add any more. You only dose 5ml to each new bottle you are about to culture. This mixture is placed in front of a 20w 2' 6500K Normal Output Fluorescent bulb for 16 hours a day and 8 hours of darkness. Rigid airtubing is inserted through the cap of the bottle, and an air pump gently bubbles around the clock. Since my cultures would crash at 5 days, you can imagine how I held my breathe in anticipation. Every day, Evan takes the bottle between both hands and rotates it back and forth quickly for a few seconds to get the sediment in the bottle back into the water column. So I do the same now. It bubbled for 3 weeks, never crashed and got darker and darker. Here is a bottle of it, next to a small bottle of DT's. 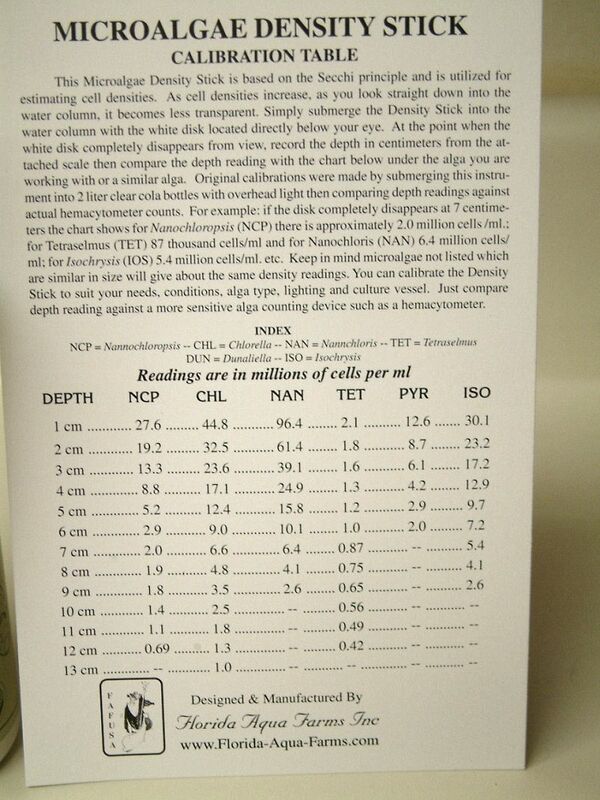 1 ml Kent's Essential Elements per bottle. So far this is working perfectly, and I'm going to start culturing rotifers in the near future. I just wanted to share the process in case you are thinking about it as well. Shaken slightly each day to stir up the solution from the bottom. Split the culture after two or more weeks, saving half for your tank and half to start new bottles. Repeat forever. After consuming an entire container of pretzels from Sam's Wholesale Club, I decided to make use of it. It works great. This will bubble two gallons of phyto, using three lengths of airline tubing to keep the phyto circulating. Courtesy of Marc Levenson melevsreef.com and reefaddicts.com, used by permission.